More and more people are realizing they are sensitive to gluten – you don’t have to have full-blown Celiac or Crohn’s disease to have a bad reaction. While it’s fairly easy to avoid gluten in the usual suspects—bread, pasta, breakfast cereal, and anything labeled ‘wheat’—gluten is tricky and can show up in the most unexpected places. If you need a great resource for eating gluten-free check out my cookbook, Ditch the Wheat. 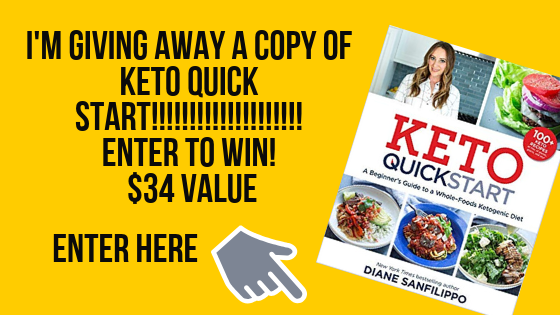 It contains 120 gluten-free, grain-free and dairy-free recipes with a ton of information for how to eat gluten-free, what to look for when eating out and how to make this lifestyle easy for you. Gluten is a cheap stabilizer, emulsifier, thickener, and flow agent that is used in products from medicines and vitamins to beauty products and beer. Food manufacturers often use gluten as an additive in a huge range of processed foods and ingredients of processed foods, from soups to self-basting poultry. For a lot of people that is fine. If you have any issues with gluten at all, you have to be informed, wary, and vigilant about knowing exactly what’s in the products you’re consuming. Condiments such as mustard, spices, and pickles are delicious and make meals more enjoyable. But, they can also contain unexpected amounts of gluten. It is used as a stabilizer and thickener in many sauce-based products and stops dry products, like spices and seasonings, from clumping. And remember, a food might be labeled ‘wheat-free,’ but that doesn’t mean that it’s gluten-free! Spelt, barley, and rye all contain gluten. Unless you made it yourself out of 100% fresh ingredients, you have to check and check again. Become an expert at reading and decoding labels, and as a rule of thumb, choose the product which has the fewest ingredients, as it’s less likely to include fillers. But there is good news – it’s not all avoidance! You can still have tasty condiments with your food. There are a number of alternatives and substitutes. More and more companies are producing gluten-free products, and supermarkets are carrying more gluten-free food—enough to fill an aisle in some cases. 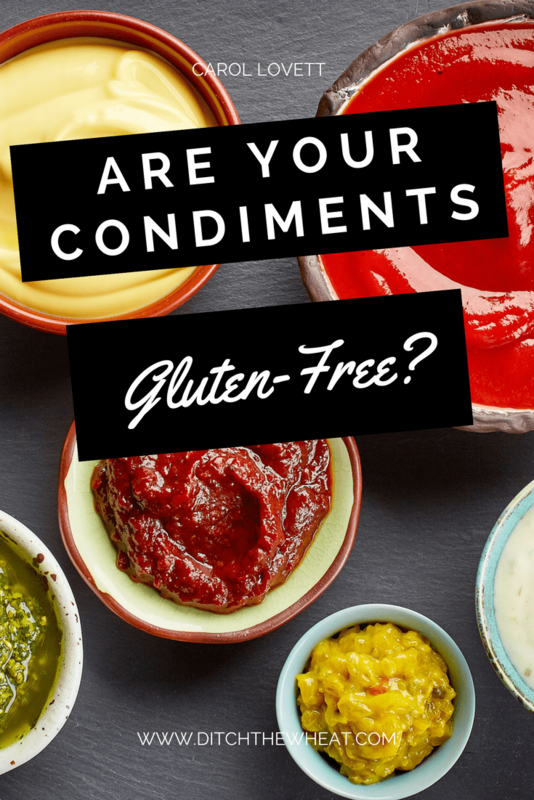 Check your preferred supermarket’s website for gluten-free options – all the major supermarket chains now have a wider range of sauces, marinades, and salad dressings available. Even more encouraging, the Condiments and Sauces: U.S. Retail Market Trends & Opportunities 2016 report noted that one of the big market trends driving growth in the industry is the “Gluten-Free Effect.” This is significant in an industry with sales of $11 billion dollars in 2013 and means that there will be even more choices available in the future. Soy sauce: Coconut aminos or tamari are excellent gluten-free substitutes. At the time of this writing, the following condiments were gluten-free. Of course, one of the best ways to control your gluten-free diet is to make your own sauces, relishes, marinades, and chutneys. But when you’re short on time, you can use any of the suggested brands and alternatives to enjoy gluten-free condiments. If you want to make your own condiments I recommend following the recipes in this ebook, Get Sauced. Did You Ever Consider This as the Cause of Your IBS?